Are you getting ready for the big 80th birthday celebration?! The 80th Firework Stringer is a shimmering multi-color decoration that is perfect for hanging. 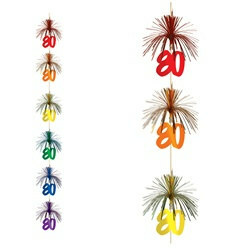 Hang the 80th Firework Stringer from the ceiling of your party room add some color and shine. Each package includes one stringer measuring seven feet in length. Received in very timely manner. Items faithful to advertisement. Thank you. These were very pretty and just the right size for hanging in door ways. Was looking for something a little more decorative and the firework stringer was just what I wanted.